I have been very into 1970s lately – guess I’m reliving my childhood. Watching The Bionic Woman, Wonder Woman and now binging Charlie’s Angels. 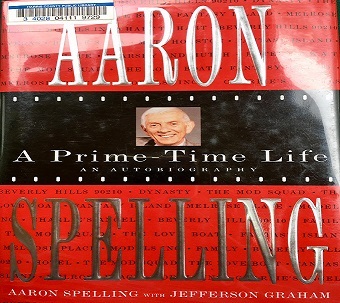 So I thought now would be a good time to read Aaron Spelling’s autobiography that I have had for years. Plus one of my favorite shows in Beverly Hills 90210 and Aaron had some Elvis connections. I remember in one Elvis book I read Elvis was on Aaron Spelling’s place or Aaron was on Elvis’ and I never knew how they knew each other. Now I know. Aaron was married to Carolyn Jones while she was costarring with Elvis in King Creole. And later he dated Mary Ann Mobley, who costarred with Elvis in Girl Happy and Harum Scarum.